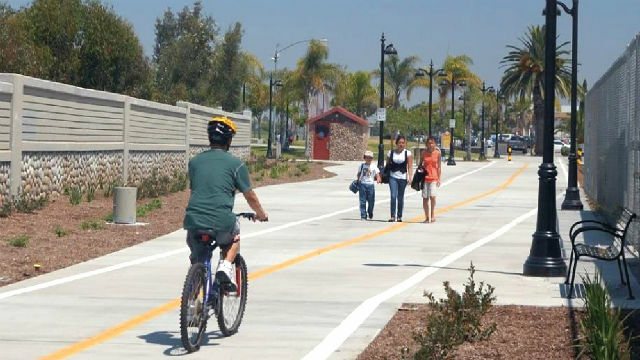 A SANDAG-sponsored bikeway project in San Diego County. The San Diego Association of Governments announced Thursday it will offer $3,000 grants for local programs and projects that encourage bicycling as a transportation choice. The agency will award up to $60,000 in grants through the program, with a focus on bike education, safety and promotion. Entities like nonprofit organizations, chambers of commerce, colleges and universities and San Diego County school districts are eligible to apply. Applicants must detail what they plan to fund with the grant, such as bike education classes, public bike events and rides and bike to work and campus promotions. Applicant activities must be open to the public and happen between March 15 and June 15 of next year to be eligible for funding. SANDAG is administering the “GO by BIKE” grants in advance of National Bike Month next May. The agency will accept applications through Dec. 21 and award them by Jan. 31. Interested residents and potential applicants can learn more about the grants at 511sd.com/iCommute. Posted in Life | Tagged bicycling, National Bike Month, San Diego Association of Governments.